Freedom House’s Freedom on the Net report, conducted in 60 countries, examines the civil liberty, freedom and censorship trends in Pakistan over the past year. Scoring “Not Free” for Internet Freedom, 2015 marks the fourth consecutive year that Pakistan joins the host of nations share the same worst score, with policies that curtail freedom and civil liberties. The government of Pakistan continues to take ever greater steps to gain further control over the digital spaces that its citizens use, ostensibly to protect them from terrorism and criminals. While it is the duty of the state to protect its citizens, it is also the paramount duty to ensure the right to privacy, the right to freedom of expression, and the right to civil liberties are protected. As the Freedom on the Net report will show, the government is taking further steps to further curtail these rights, to police democratic discourse and stifle dissenting voices that are already threatened offline. 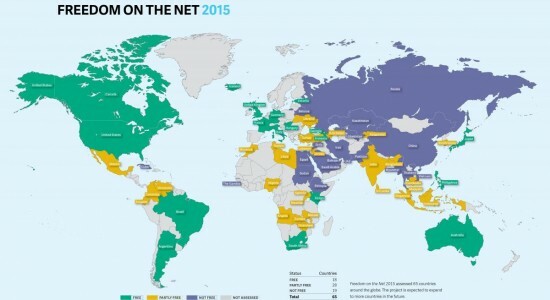 “We are troubled to report that Pakistan’s poor internet freedom score failed to improve in 2015. Communications shutdowns, violence, and blasphemy charges related to online content continue to restrict the environment for ordinary internet users. The government has also failed to lift the ongoing ban on YouTube,” said Madeline Earp, Asia Research analyst for Freedom on The Net. Freedom on the Net and the research of Freedom House seek to address the failings of the state in protecting the rights of citizens, and by compiling and analysing evidence that activists and concerned citizens can use to push for greater democracy online as well as offline. To view the country report on Pakistan in its entirety, please click here.